We started the week learning about volume and how to convert ml to l once we had cleared up a small bottle of a water doesn’t contain 50 liters! 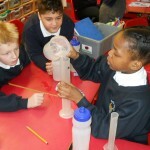 Using this knowledge Year 5 measured different amounts of liquids in ml. 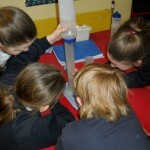 They all worked in groups and carefully measured the amounts even using different scales. Literacy has started with a focus of discussion writing giving both view points for and against. Watch out for your children at home using words like: on the other hand, additionally, furthermore, some would argue… Why not ask the children the pros and cons of closing school when it snows or if primary school children should have mobile phones. 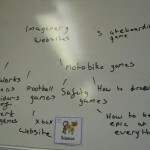 Year 5 spent the afternoon discussing the good and the bad parts of the internet as part of ‘Safer Internet Day’. 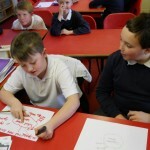 They responded in shock to the question “What would school be like without computers and the internet?” Some children don’t know how we coped in ‘the olden days’ without it at school. The most common response was though was boring. 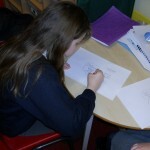 It’s great to see how the children appreciate the use of ICT and the internet as part of their learning. 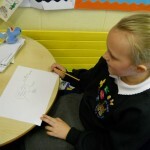 We then decide to think of what we would prefer more or less of on line. Through brilliant group work we decided we need less adverts blocking our games or videos and less hackers ruining the internet for people. 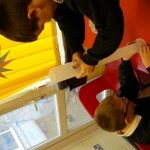 They would like to see more children friendly games and those where they can learn and enjoy it. 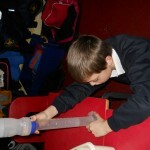 It was great to see how aware the class are of safety on line and what to do if they don’t seem safe.